Demand for sustainable coffee is growing, a boon for socially conscious coffee lovers–but many small growers are missing out because they lack the ability to verify that their coffee beans are grown using fair labor and eco-friendly practices. In fact, verification is often accessible only to large coffee estates or cooperatives. Enveritas wants to change that. The non-profit, which recently completed Y Combinator’s accelerator program, uses geospatial analysis to make the process more efficient, enabling it to offer free verification to small farms. Enveritas’ goal is to end poverty in the coffee sector by 2030. Before founding Enveritas in 2016, CEO David Browning and head of operations Carl Cervone worked at TechnoServe, a non-profit that serves businesses in developing economies. Browning led TechnoServe’s global coffee practice, while Cervone advised coffee growers in Africa, Asia and Latin America about sustainability trends. Sustainable coffee isn’t just in demand by caffeine lovers with a penchant for social justice. Many of the world’s biggest coffee companies, including Illy and Starbucks, have launched sustainability initiatives as part of their corporate responsibility measures. 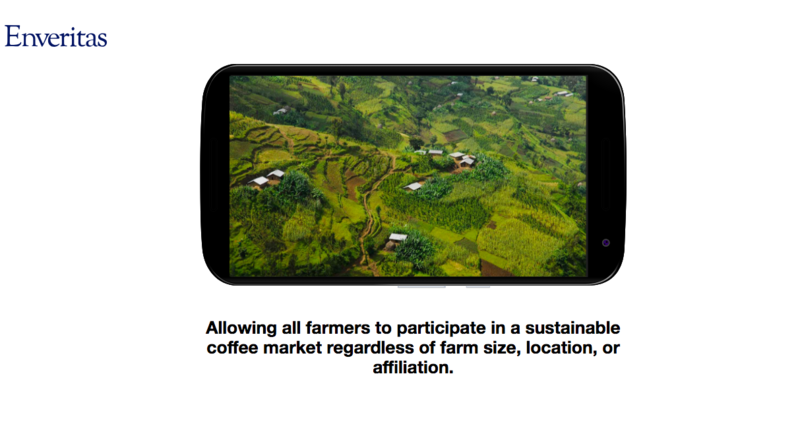 Offering coffee grown using fair labor or environmentally friendly practices also helps differentiate their products in a crowded marketplace. Research by the National Coffee Association, an American trade group, recently found that many millennials prefer sustainable coffee, with up to two-thirds of 19 to 24 year olds surveyed said they pick their coffee based on whether it was grown using environmentally-friendly practices and fair labor. While coffee is currently its main focus, Browning says Enveritas’ system can be applied to other agricultural products that need more visibility in their supply chains. For example, it can also be used to verify the sustainability of cocoa, cotton and palm oil. As a non-profit, Enveritas faces different funding challenges from other tech startups. Browning says it is currently at the equivalent of being ready for a Series A. Much of its backing comes from coffee companies (Enveritas can’t disclose which ones) who hope to benefit from Enveritas’ solutions. Next articleShould you be using the computer for other things if computer is running appium automation tests for Jenkins? Will it cause tests to fail?